Leaving your job can be exciting and daunting at the same time! 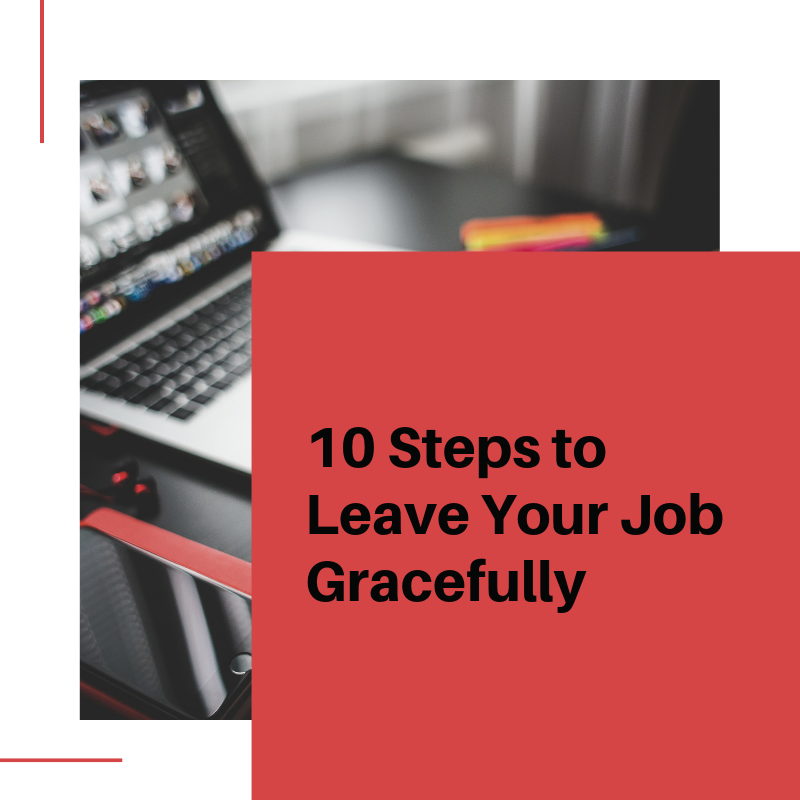 Here are 10 steps to leave your job gracefully. These steps will insure that you don't burn any bridges and that you set your replacement up for success. You are excited to start this new chapter of your life and want to share the news with your work best friends. Don't. You want to avoid starting an office gossip and don't want anyone to overhear your news. When leaving a job the last thing you want is for your manager to feel disrespected, and for the "I quit" conversation to be any more awkward than it naturally is. We recommend putting in your notice on a Friday afternoon. Hopefully, your office has cleared out a little so you and your manager can have a few moments of privacy. The tone of your "I quit" conversation will dictate the type of interactions that you have with your office for the next few weeks. Be wise in your choice of words. If you are unable to quit on a Friday, we recommend a Monday afternoon. Just like when you break-up with someone, don't quit via text message, Skype, Slack, voice mail, or email. It is common and professional courtesy to reach out to your boss set up a one on one meeting and let them know the news. This allows both of you to ask questions and come up with a plan moving forward. Industry best practice when leaving a job is two weeks notice because it allows for enough time to complete any open work or hand it off to another team member. This should be the minimum amount of time you give your employer to find your replacement. According to Harvard Business School Professor, Leonard Schlesinger, managers should provide four two six weeks notice, so that your company can find and train a suitable replacement. As a note, you might want to double check the contract you signed with your current employer to ensure that two weeks is enough (some companies ask for more time). This may seem redundant; you just put in your two weeks notice verbally with your boss, right? This is more of a formality and a best practice for both you and your HR department. A two-week notice letter is meant to state when you are planning to stop working for the company. Other companies may request a verification of employment and with this document your HR department will be able to refer back to when exactly you left the company. No matter why you are moving on it is important to finish strong at your current company. At Kavaliro we had a team member who put in roughly four weeks notice because she got her dream job! We were super sad to see her go because she was an asset to the team. During her last four weeks with us, she continued to hit her numbers and work hard. She had the top call volume and had several candidates interviewing. In short, she finished strong. This is the last impression you are leaving with an employer don't waste it. In the case of our recruiter, someone called us for a reference, and we had a glowing recommendation for her because of her hard work. Once you put in your two weeks (or more), your boss is going to start looking for your replacement. Once they hire someone to replace you, it should be your mission to get them up to speed as quickly as possible. This decreases the amount of work your team is going to have to pick up and keeps deadlines for being missed. While there will be a learning curve, you should do your best to assist with the transition. Training your replacement also helps you finish strong in the eyes of your employer. A goodbye email is one of the classiest things you can do when leaving a job. There are two different general formats when it comes to goodbye emails. First, you can send it to your whole team thanking thing each for what they have tough you and the laughs they have shared. The second format is to send an individual email to each person you wish to thank. No matter which route you take, you should always send a thank you email to your manager. Now that you are finally in your new job it might be tempting to talk about the short comings of your manager, coworkers, or the company you just left. Don't do this! The world is a small place you never know who knows who! This is one of the most under utilized tips we have to share! Stay in touch with your coworkers and managers. No, you don't need to have brunch with them every other weekend but keep an eye on their LinkedIn profile. Congratulate them on promotions, birthdays and anniversaries. This is a great way to build your network, the world is a small place, and you never know what is going to happen next!